By the early 20th Century greetings postcards had become more popular than folder cards as they were cheaper to post. During the First World War a ban on Christmas cards was mooted to conserve supplies of paper but the idea was rejected in the interests of maintaining morale. The propaganda potential of the postcard was exploited for the war effort as this satirical card at the expense of the German Kaiser illustrates. Postcard in portrait format. 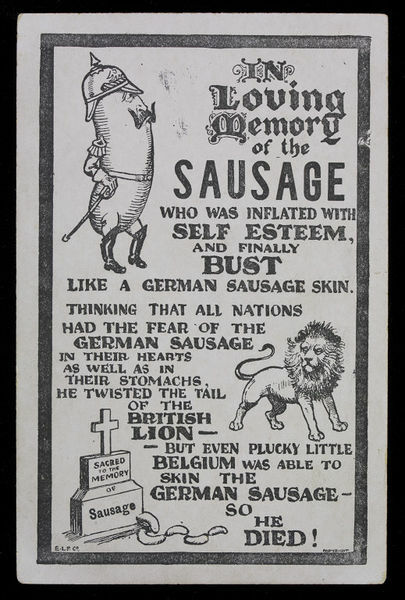 On the front: humorous "poster" announcing the death of "The German Sausage" with text and illustrations printed in black within a black border. On the back: postcard template printed in green, V&A Museum stamp in black ink, former number and pressmark handwritten in black ink. 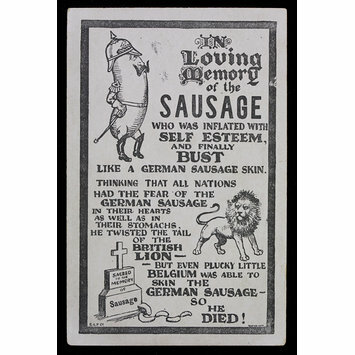 Postcard, letterpress on card, 'In Loving Memory of the Sausage', published by E.L.P. Co., Britain, World War I, 1914-1918.